One cool development in my personal writing life in 2018 was my rediscovery of my love of fountain pens and in writing longhand. I’ve always found a certain pleasure in writing longhand. It feels as if the words are in my hand as opposed to my head, in a way. Writing by fountain pen is particularly enchanting. The way a fountain pens work is that the tines of the nib spread out just ever-so-slightly when you press the tip to the page, allowing ink to flow between them. In a way it’s like you’re not so much writing but rather painting the words on to the page, with a brush made of metal and just two bristles. The cautionary tale of the ink blob is to make sure your paper is thick enough for fountain pen use. Liquid ink does, and will, soak through cheap thin paper more readily than thicker, more expensive paper. That blot pictured above? It looks bad and it was a momentary inconvenience–but not one bit of it soaked through to the next page in this pad. I have not returned at this time to actually drafting my stories in longhand, though I still may at some point. But I have been writing longer pieces this way, as well as generating story outlines and worldbuilding notes and the like. The slowing down of the writing process that comes from writing longhand does enforce a certain slowing of the mind as one works. I do get a little nervous from time to time as my brain starts trying to leap ahead of what the fingers can do with a pen, but generally I find writing longhand a soothing experience. And ultimately it’s nice to set aside the digital tools and return to a form of writing that has a very definite physical component. There’s a sense in which writing longhand feels like a return of sorts, a getting-in-touch with some earlier form of art. It’s the writer’s equivalent of a carpenter erecting a chair without using power tools of any kind, relying on precision cuts and joinery made with hand tools. I also like to remember that the ink-filled pen at one point constituted a huge technological advance over dipping quills. I won’t be trying those any time soon–at least I don’t expect to–but I do own a couple of glass dipping pens which I’m long overdue to try. So if your own writing is a bit humdrum, may I suggest: Try writing longhand for a bit! It doesn’t even have to be a fountain pen on nice paper. A cheap Papermate in a spiral notebook is just fine, if that’s how you roll. But you might find that changing the physical feel of the process helps jar something loose in your mind and make the story flow. At least, sometimes that works for me. See you around the Galaxy, folks! If you haven’t been here in a while, yes, I’ve redesigned the site again. I was never in love with the second design I had in place, and finally I decided that it was just plain not something I wanted to keep, so now I’ve redone things. I think I like this design best of all, so far. We’ll see. So yeah, I’ve got a lot of editing to do. Those five binders and folders comprise four books: Forgotten Stars IV, Book One of Seaflame!, the second John Lazarus book, and the untitled kayaking-trip-from-hell stand-alone horror book that has been knocking about my hard drive(s) for a few years now. What else is going on? 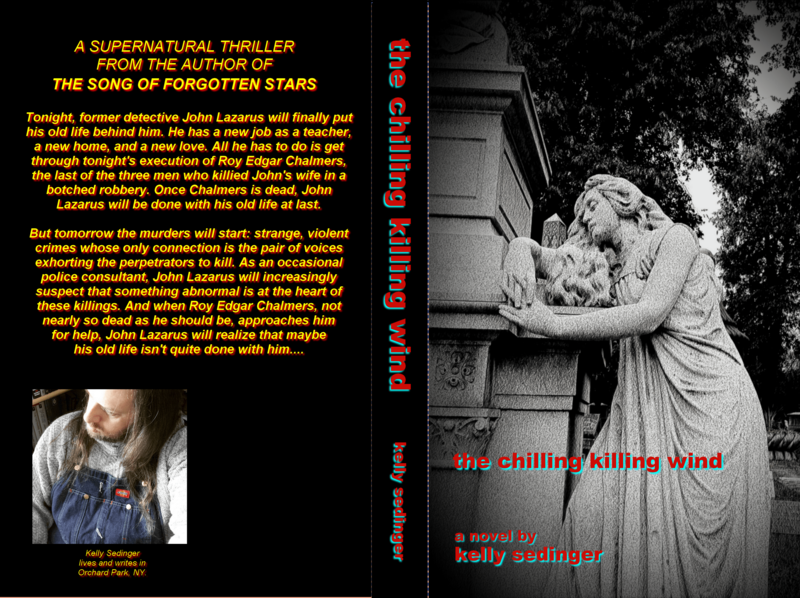 Well, THE CHILLING KILLING WIND is available as an e-book! Get it here! Finally, I continue to write for BYZANTIUM’S SHORES and for THE GEEKIVERSE, and I hope to produce more material at all my sites moving forward. More on that, erm, later. So that’s where things stand right now. Writing, editing, new e-book, stuff for other blogs and sites. I’m swamped!